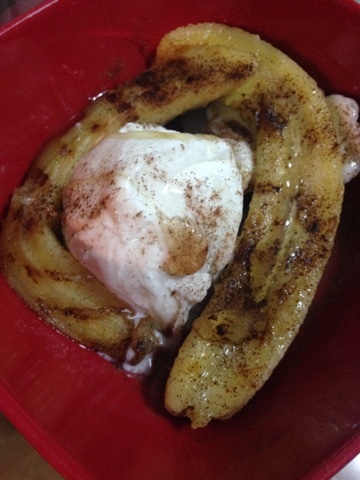 I had a sweet tooth...made my way to the kitchen and spotted a banana, honey, cinnamon and sugar. I took one banana and cut it in half, then lightly cooked both sides for a minute each. 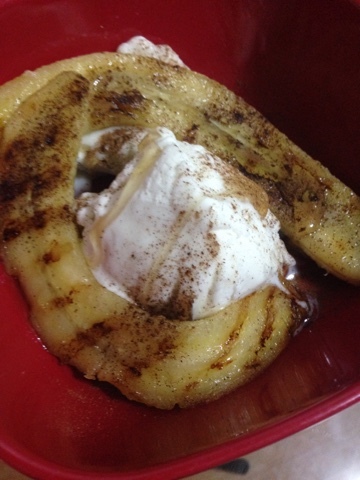 Layed both sides on top of two scoops of frozen vanilla yogurt then sprinkled cinnamon and sugar on the bananas...then drizzling some honey on the entire desert. VOILA! When I tell you this was a delicious and healthy desert, it was so good that I made it again the next day.